One of the largest supervolcanoes in the world sits underneath California, lying dormant for the past 100,000 years. 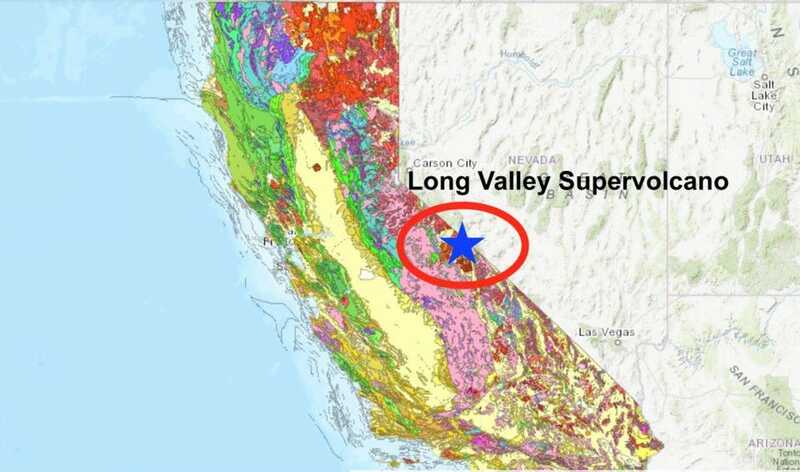 Now, researchers have gotten a clearer glimpse into what lies below the Long Valley supervolcano, uncovering 240 cubic miles of magma sitting beneath California. It's important to start off by saying this absolutely doesn't mean there is any imminent danger. Experts at the United States Geological Society (USGS) are actively monitoring the supervolcano, and while there has been an uptick in activity over the past four decades, there are no signs of an eruption. What Is the Long Valley supervolcano? While you may have heard quite a bit about the supervolcano sitting beneath Yellowstone National Park, you may be unfamiliar with another major supervolcano in the United States, the Long Valley Caldera. The Long Valley Caldera sits in eastern California adjacent to Mammoth Mountain and measures 20 miles long by 11 miles wide. A caldera is basically a depression formed after the eruption of magma to the surface. As magma fills up the magma chamber below a volcano it expands the crust and the volcano grows. After an eruption, there is a tremendous amount of volume that has suddenly been displaced, which causes the ground above to sink into a bowl-shaped depression, which we call a caldera. The Long Valley Caldera is the depression formed from the supervolcano eruption 760,000 years ago, which ejected hot ash, lava, and toxic gas. The eruption 760,000 years ago erupted 140 cubic miles of material from the supervolcano. To put this into perspective, the 1980 eruption of Mount St. Helens erupted 0.29 cubic miles of material, meaning the Long Valley eruption ejected nearly 500 times that amount of material. If all of the 240 cubic miles of magma found beneath the Long Valley supervolcano were ever to erupt, it would eject over 800 times the volume of material as the 1980 Mount St. Helen's eruption. This is the reason geologists with the USGS continuously monitor the supervolcanoes that lie dormant beneath America. If and when one does erupt, it will trigger catastrophic destruction and loss of life. Fortunately, there is an extremely low likelihood of any supervolcano eruption occurring in any of our lifetimes. These eruptions happen very infrequently, but when they do happen, the world notices. Scientists began noting that the Long Valley caldera began growing around 1978 and has been doing so ever since. This gradual growing likely represents the influx of magma into the magma chamber below the supervolcano, essentially filling the tank in preparation for the next eruption. While the supervolcano has been studied for decades, it has been difficult to determine the amount of magma that lies beneath Long Valley. A recent study, published in the journal Geology, lays out new data in our understanding of the magma reservoir. Researchers from the U.S. Geological Survey's California Volcano Observatory in Menlo Park, California, were able to image a previously "blind" spot beneath the supervolcano. The team used seismic tomography to study and estimate the reservoir volume and degree of melt. To do this, geologists and geophysicists emitted strong waves from an array around the Long Valley Caldera. As the waves traveled through the Earth, it would have bounced off rock differently, depending on the chemical makeup of the rock, whether it was liquid or solid, the angle, etc. They then measured the waves as they came back to the surface of the Earth. 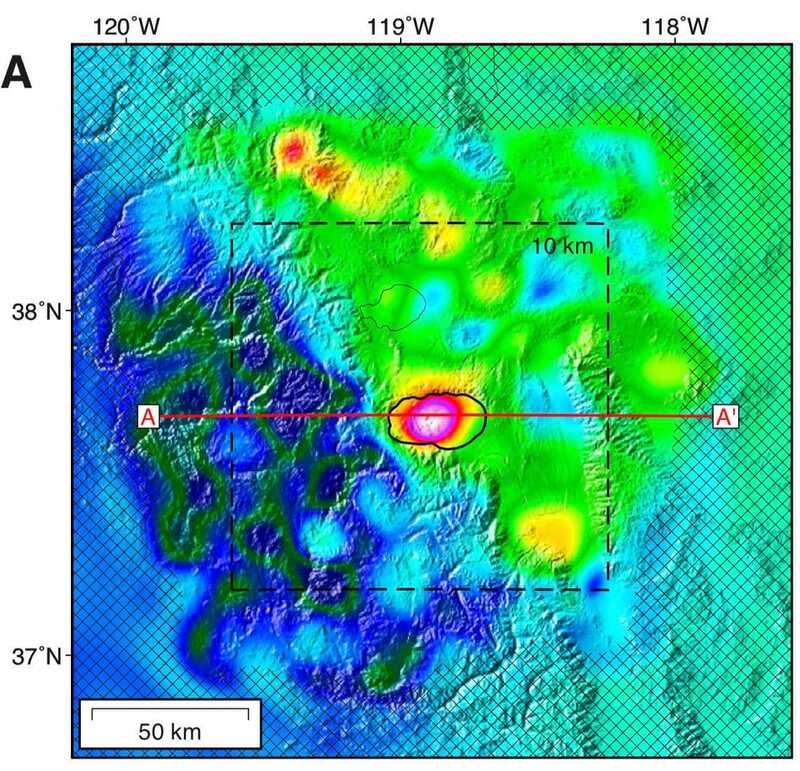 By using a supercomputer at NASA's Ames Research Center, the team was able to decode an image of the subsurface and map the reservoir of both solid and molten rock beneath the Long Valley supervolcano. The team found 240 cubic miles of semi-molten magma, with 27 percent in the liquid state. At this point, there are no signs of an eruption and there's the potential for the proportion of liquid magma to continue to decrease as the supervolcano continues to lie dormant. While the Long Valley supervolcano isn't an immediate threat, the potential scale of an eruption urges scientists and the public to keep a close watch on the happenings around Long Valley Caldera in California.